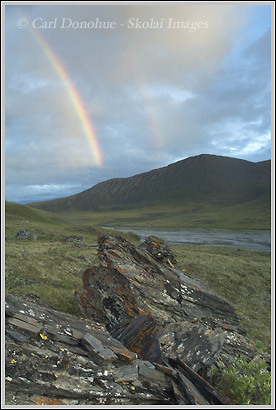 This is another photo from my series of photos from ANWR. This particuar evening I was returning back to camp about midnight when this rainbow appeared. It had been a pretty long day, and I was actually ready to hit the sack. At first the rainbow wasn’t that special, and I kept trying to convince myself it was ‘just a rainbow’, and not worth heading over to photograph it. As I got nearer my camp, the rainbow started to glow stronger, and then a second rainbow appeared behind it. I grabbed my polariser (filter)and started looking around for a composition to complement the rainbow. I loved the lichen covered boulder seen here, and spent some time trying to figure how to make a nice photo from a couple of scattered rocks. I ended up with a few compositions from here, and maybe I’ll post another tomorrow. What I wanted to show here was the simplicity of much of the arctic landscape. It’s very open, even at sea level, because it’s so far north. Treeline pretty much stops south of the continental divide, so once you’re on the north side of the Brooks Range, the “North Slope”, it’s open tundra, with a few scattered stands of willow, a poplar or two, and lots of rocks. It can be somewhat overpowering to feel such vastness at times. Some folks refer to this expansive range as ’empty’ because it’s so sparsely populated. I don’t think it’s empty at all. I feel a richness here, beautiful in its simplicity, inviting in its openness. The broad sweeping valleys, formed eons ago by the great glaciers that once owned this land, hold me in awe. It’s amazing to sit and stare at a simple riverbed that is several miles across. It’s even more over-whelming to start hiking across such a riverbed, expecting to make it to the other side of the valley in 20 minutes or so, when it takes an hour or more. Even crazier is to hike for 4 or 5 hours and still be able to see camp where you started out from. ANWR’s a special place, and I sincerely hope we learn how to value such wilderness over profit before it’s opened to drilling. More on that subject later. This entry was posted in Adventures, Alaska, ANWR, Backpacking and Hiking, Landscapes, Travel on May 10, 2007 by Carl D.
I don’t remember seeing this one before – sweet! Thank you man. I actually nearly mentioned you when I wrote that post; it was a conversation with you that led me to using the polariser filter for the rainbow. Thanks for the tip!